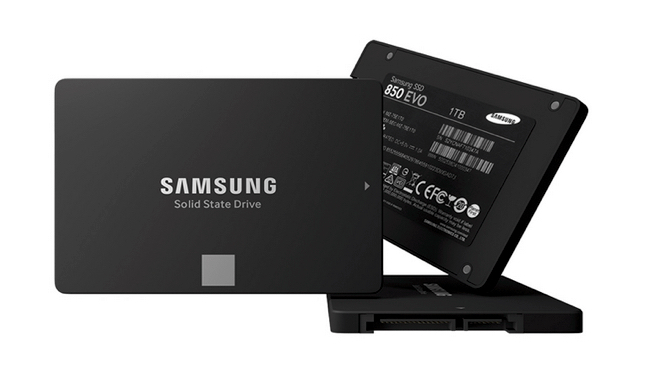 Just in time for Christmas, Samsung has taken its 3D enterprise SSD, added a bit per cell, and come out with a longer-lived 1TB SSD for PCs and notebooks. The triple-level cell (TLC), 3D V-NAND, 850 EVO SSD follows on from the planar (2D) TLC 840 EVO which also topped out at 1TB. This drive used 19nm NAND, whereas the 850 EVO is understood to use 40nm-class NAND, meaning cell geometry between 49nm and 40 nm in size, much larger. Other things being equal the larger the cell geometry the longer-lived the drive in terms of write cycles, and changing from 19nm to 40nm NAND is a big cell size jump. Stacking layers of flash cells in a single chip increases capacity without increasing the chip's footprint. Samsung has given the 850 EVO a 5-year warranty as a result; the 840 EVO having a 3-year one. Sequential performance is the same as the 840 EVO, up to 540MB/sec when reading and 520MB/sec when writing. The 750GB variant has been dropped. The 840 EVO's MEX controller has been upgraded to an MGX version and the drive is self-encrypting (AES 256-bit). According to Anandtech, Samsung's technology would permit a 2TB drive if the marketing people saw enough demand for one. Samsung says it will bring out an extended line-up of the 850 EVO in mSATA and M.2 form factors next year.